Celebrate the flavors of Fall with this salad! 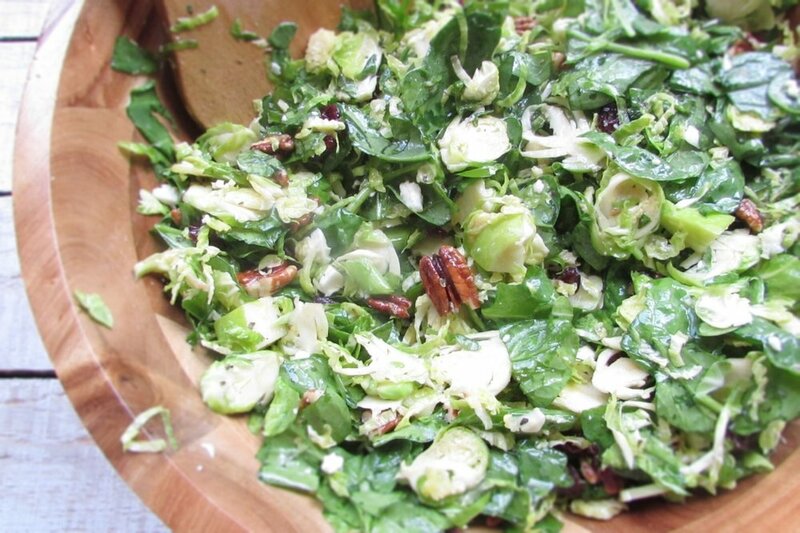 Shaved Brussels Sprouts are highlighted alongside spinach, apple, feta cheese and walnuts. Dried cranberries and Maple Dijon Vinaigrette add a touch of welcome sweetness. Brussels Sprouts are such a versatile winter vegetable - saute in a little olive oil, roasted (try Apple Cider Vinegar Glazed Brussels Sprouts) or use them raw for a salad. These cute little mini-cabbage looking vegetables are packed with Vitamins C and K along with fiber. They also contain a phytochemical called sulforaphane. Overcooking them will yield that strong sulfur smell and flavor so I like to roast or stir-fry them if cooking, rather than boiling. I've taken this salad multiple times to potluck dinners (keep the vinaigrette separate and toss just before serving). Leftovers will last up to three days in the refrigerator, even with the dressing. In a small bowl, prepare the vinaigrette. Combine the maple syrup, shallot, apple cider vinegar, Dijon mustard, salt, pepper and garlic. Whisk in the olive oil until evenly blended. Set aside until ready to dress the salad. If using whole Brussels sprouts, slice off the stem of each Brussels sprout and cut in half. Thinly slice the half horizontally, shaving the Brussels sprouts. In a large bowl, combine the Brussels sprouts and spinach. Add the rest of the salad ingredients. Pour the vinaigrette over the salad and toss thoroughly until well mixed. Modifications: Add cooked chicken, fish or beans such as chickpeas or black beans to make more of a one-dish meal.